This weekend’s Super GT action at Fuji is now upon us and for Honda ace Bertrand Baguette it comes just days after he finished the Spa 24 Hours in the Castrol-backed NSX GT3. The Spa 24 was a break from the norm for Baguette, who normally races with Nakajima Racing in a GT500-spec NSX. The week in Belgium saw him make his debut with Castrol Honda Racing, in what was a high-profile and significant entry to the event. 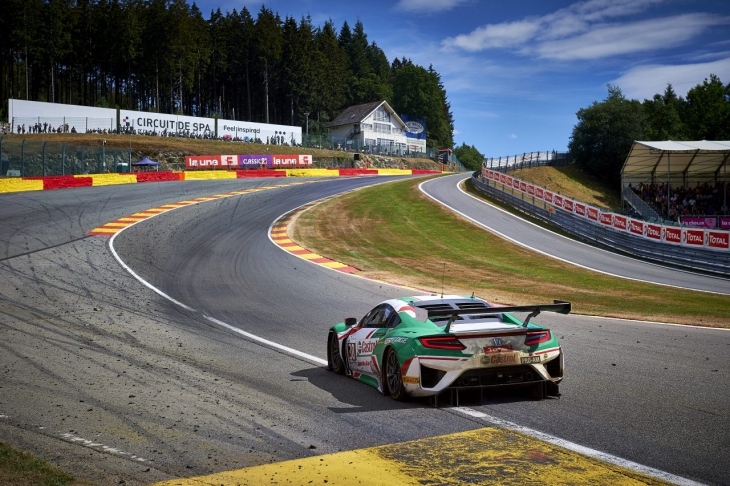 In the Ardennes Baguette and the team were tasked with debuting the NSX GT3 in Blancpain competition in the Pro-Am class which was littered with high-profile teams, drivers and proven machinery. In the end though, it proved to be a success for everyone involved. 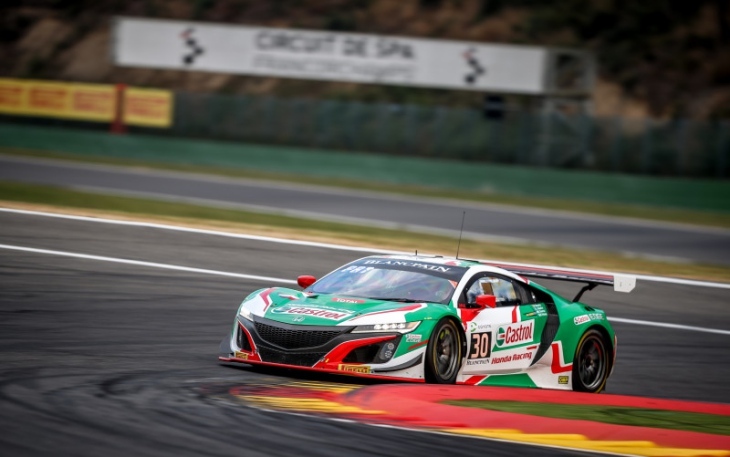 While the team were unable to not challenge for the class win in the end, the NSX GT3 proved its worth, finishing the race seventh in class after 490 laps of the Spa-Francorchamps circuit. The team’s only misfortunes were a puncture, an issue with the car’s air conditioning and a few penalties. All-in-all, for a new team, with a set of drivers new to the car, it was a hard earned, but richly deserved result. Baguette and teammates Riccardo Patrese, Loic Depailler and Esteban Guerrieri all drove well during and managed to produce the goods for the JAS Motorsport-run, team, which hopes to use its Spa 24 Hours performance to help attract customer programmes. 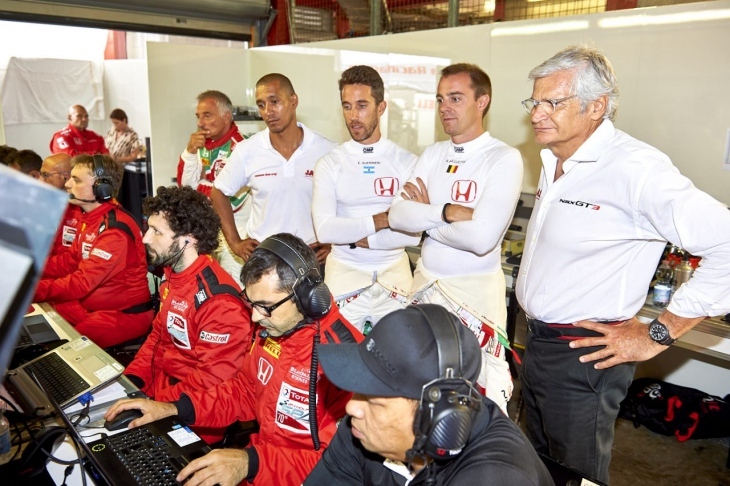 For Baguette, who lives in Verviers and campaigned long ago to get a seat in the race when he joined Honda, it was important to have a good run. 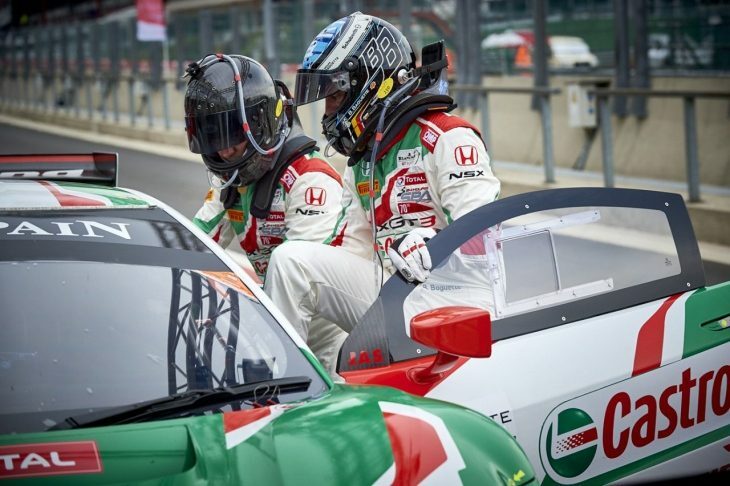 “It’s my fifth year this year as a Honda factory driver in Super GT,” he told DSC. “Of course I live in Spa, so I told Honda if they ever raced at Spa with GT3 or something that I want to be a part of it. The Spa 24 is a very important race for me, so I got the call up, but only a month before the race. I didn’t actually drive the car until the Spa 24 Test Day. “It’s such a different car to what I’m used to racing in Japan, GT500 cars are so much faster and it would probably be 15 seconds quicker than a GT3 at the circuit. It’s still very challenging to drive Spa in the NSX GT3 though. “The main target was to finish and we made it so the weekend is good and we can be happy. The car was running very smoothly all the race apart from the A/C issue, and the laptime we did in quali was close to the best. “The car was new, the team was new, and I was the only one who had done this race before so what we did we can be really proud about. A race like this takes everything out of you – you don’t sleep, you have to push hard for so long – it’s tough for everyone from the drivers to the mechanics and engineers. 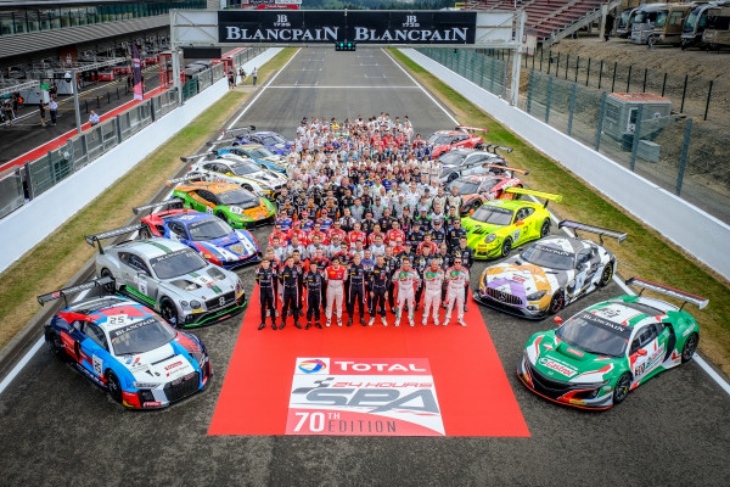 Before this year, Baguette had competed at Spa in the 24 Hours before – as recently as 2016 – and notes that the event has changed dramatically, but not neccesarily for the better either. Baguette explained that the newer rules like Joker pit stops, maximum stint times and minimum stop times have made it overly complex for some of those taking part. “To be honest, there’s a lot of rules to take in,” he explained. “There’s so many details to understand now. It’s a very different race now, the Qualifying is different, Full-Course Yellows are different, and the pit stop rules are different. I’m a bit torn, it’s a bit too much. “In Super GT we can race the cars, we can do pit stops as quick as we want. And that seems logical, surely in racing you want to be the quickest everywhere? We don’t have FCYs even. So here it can be hard to understand. Riccardo (Patrese) arrived and he told me “last time I came here there were no rules at all! The target was to go as fast as possible.” Now it seems it’s almost too easy to get penalties. 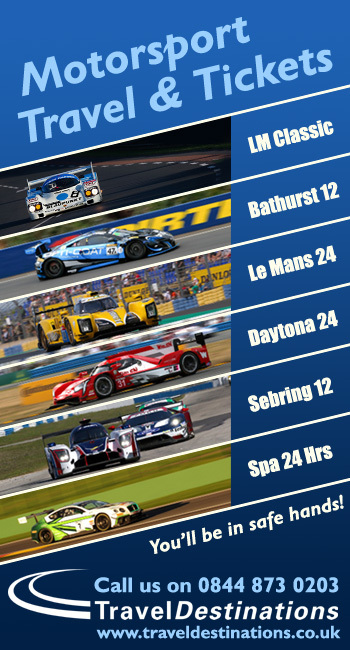 One potential solution, Baguette feels, is to open up the rulebook for the Pro class, allowing the teams up front with the big budgets and factory support to race freely. Going forward, Bagette is unsure whether he will race an NSX GT3 again in the forseeable future, so instead, he is now focused once again, fully on Super GT. “For the moment Spa was a one off for me. 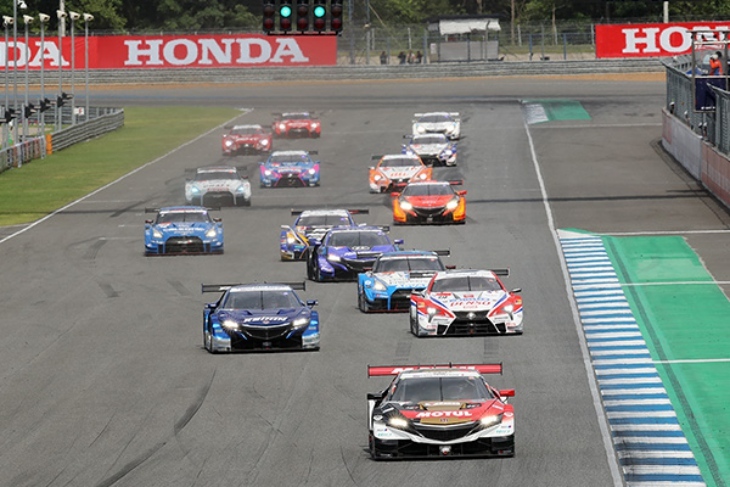 But Super GT is going so well in Japan, and Honda too is having a great year. There’s a lot of interest, and so many sponsors getting involved. “GT500 is a all-out war, we have a tyre war, we have manufacturers pushing. And it’s so important and beneficial for everyone involved, because so much effort is put into the promotion. “People go to those races, it’s so different to the big championships in Europe. Out in Super GT, it’s so fan friendly, I come here to Blancpain, and now it’s treated like F1 in the paddock, whereas Super GT is the opposite, fans can get close to the cars and drivers. “If you want fans to come, you have to give them a reason to I think. That’s how you grow a fan base. “And that’s why I love it in Japan. It’s the reason I don’t want to leave. “This year it’s been harder for me, as my car is the only one on Dunlops, so at times we struggle. But Honda has done so well this year, the car is just so much better, and they lead the championship. As for the Honda GT3 programme going forward, JAS CEO Alessandro Mariani told DSC that fielding cars in the IGTC races next season could be a possibility to help kick-start the NSX GT3’s life as a customer car. “Spa is such an important event,” he said. “But after we want to continue to show the car off. In Europe we have only one car running, in the ADAC GT series. So Spa 24 allowed us to show lots of teams what we can do. The target at Spa was purely commercial, as the car has already had good results in the USA as an Acura. “When we started this project, the market was increasing, and now the market is stable. Potential customers already have good cars, so it’s not easy to enter in this market. You also have to consider that you need a long time to establish yourself. For Honda this is a return to the market, and as you can see from the competition in GT3, they’ve all been here for like three or five years at least. “The mission of JAS is to contribute to the project, develop, build the car, market it in Asia. It’s not to race, unless there’s an iconic race like Spa or Macau, where we’ll use that for experience. We don’t have a precice plan now, we have contact with teams for the future, and we’re looking at the IGTC, it could be an ideal competition for showing off the potential of the car.